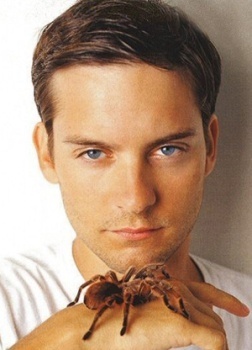 A hot rumor floating around Hollywood has sad-eyed angstmeister Tobey Maguire trading in his Spider-duds to suit up as Bilbo Baggins in Peter Jackson's upcoming film The Hobbit. Rumors come and go pretty quickly in the magical movie realm of Hollywood, particularly when it comes to major productions like The Hobbit, the prequel to Peter Jackson's epic Lord of the Rings trilogy. But this one looks like it might have some weight to it. According to a report by Latino Review, Maguire said during the filming of Brothers last month that the next director he'd like to work with is none other than Guillermo Del Toro, who just happens to be directing The Hobbit. Furthermore, Maguire added, "We may have something here in the near future." The site checked with the Creative Artists Agency which represents Maguire and it turns out the report is accurate. The discussions are still in the early stages and no offers have been made, but the actor will be available for filming between the shoots for Spider-Man 4 and Spider-Man 5, so it seems like a natural fit. His inclusion could also help convince Warner to approve the project, which is currently being developed by Jackson and Del Toro on their own dime. So what do we think? Will Spider-Man make a good Bilbo, or is there someone better suited to the task? Let's cast this movie!